Homage for Heidi Grundmann / #Wiencouver18 was a live collaborative network radio art event broadcast on July 1, 2018 by Kunstradio in celebration of both their 30th anniversay and Heidi Grundmann’s 80th birthday. ** Peter Courtemanche curated and mixed the Vancouver audio, with artists Deanne Achong, Hank Bull, Anna Friz, Igor Santizo, and Sarah Shamash. I started preparing objects and music to use for said le mash-up, and as I began to take them out (kitchen pots, clothespins, castanets, an old CD that looks at Trinidadian music from 1939 —alas one year too late, but also problematic in its archaeological otherness as was par for the course in those times) I got a touch frustrated muttering to myself “I’m not a sound artist”. So, I took my sulky self off for a brisk walk around the park and listened to a podcast by Karlheinz Essl “Where’s the rainbow” a “binaural sound performance as a sonic comment to Peter Paul Ruben’s painting “Landscape with Thunderstorm“, broadcast on Kunstradio. After a couple of laps, I started thinking about cheesecake. 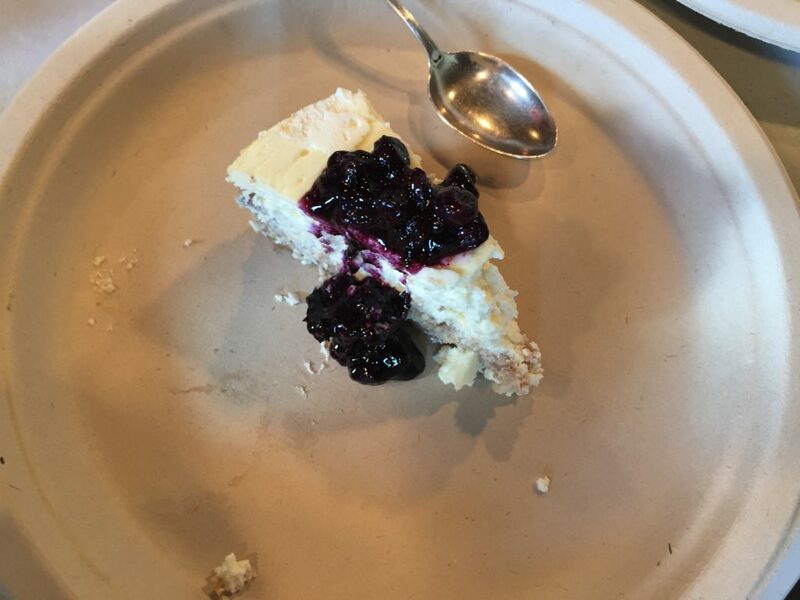 Not just ordinary cheesecake, but Keto friendly cheesecake. (If you haven’t heard of the Keto craze, how lucky you are). So translation — almond flour, coconut flakes, ground flaxseed as the base, eggs and creamcheese with monkfruit sugar (not a frankenstein sugar or so I’m told) and farmer’s market blueberry sauce as the topping. Oh yeah and organic to boot. Gluten-free, grain-free, sugar-free … so free I am free-floating. I made said cake. And played a 1950s CD (yes a CD) of the Mighty Sparrow singing some Calypso tunes, while using my iPhone6 to record myself baking the cake with occasional singing along and reading of the recipe (from the Joy of Cooking – altered to be Keto friendly) and voilà. iPhone voice-memos are not the most sophisticated of recordings (ahem) but there you have it — the Sounds were baked. The next day I showed up at the Western Front with the cake. 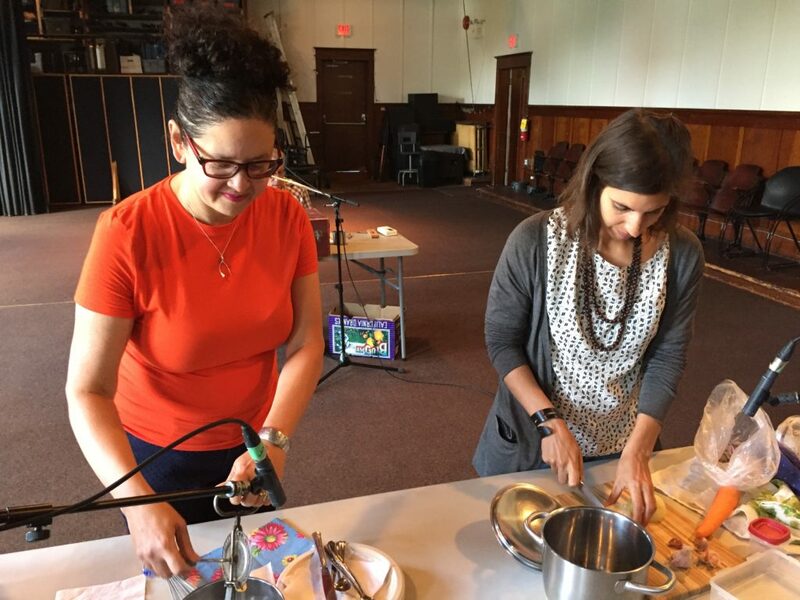 Coincidentally, Sarah Shamash, also came with kitchenalia – domestic things. 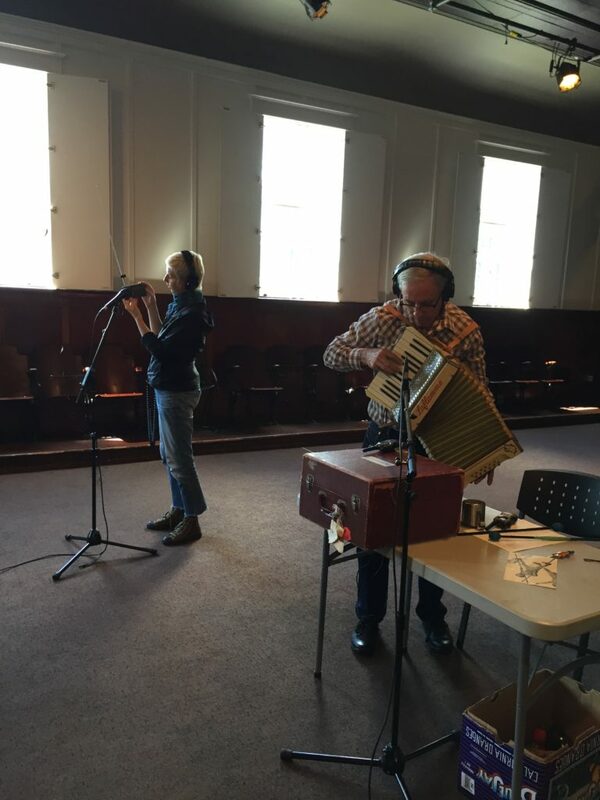 Hank Bull played the accordion, a rubber ducky and various objects, while improvising dialogue with sound and radio artist Anna Friz . 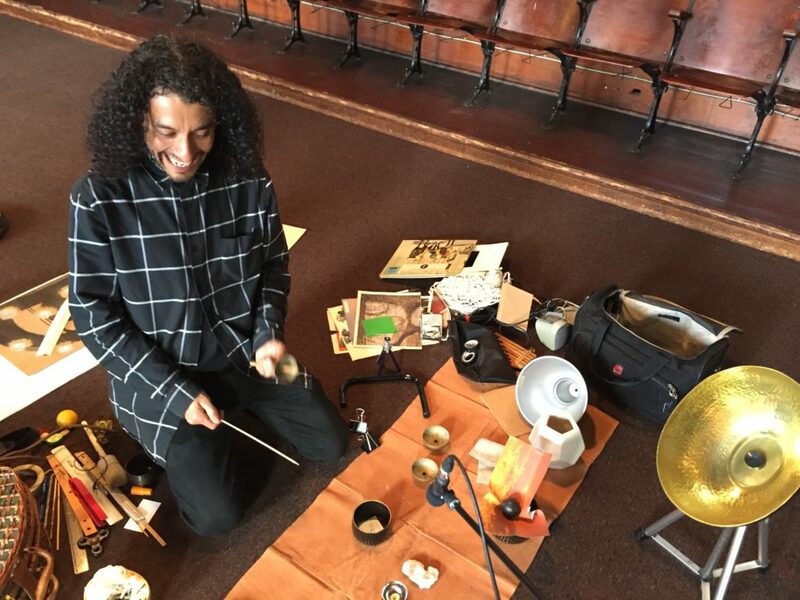 Igor Santizo had a huge spread of different objects that he used for percussion and instrumentation, fluttering papers having particularly caught my eye. 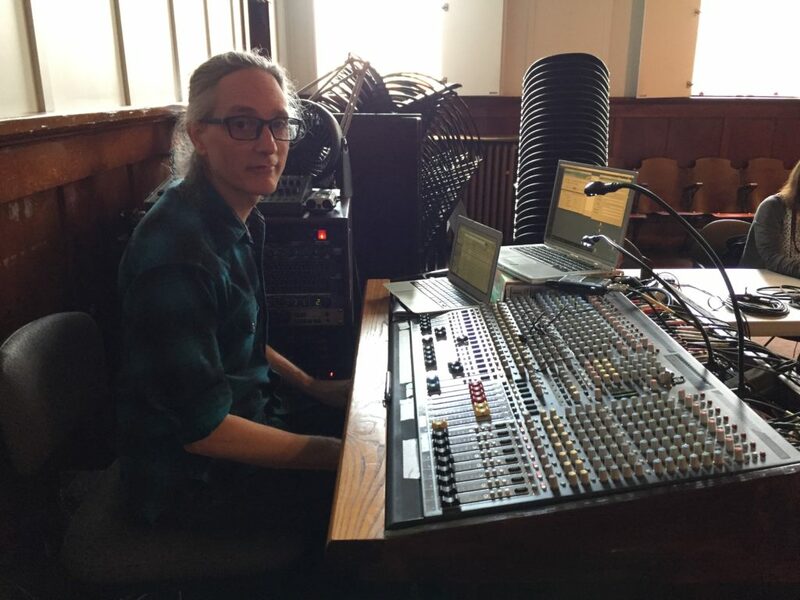 In addition to the live broadcast, Sarah, Anna and myself had some pre-recorded sounds that were plugged in and Peter Courtemanche live mixed / remixed the whole lime. He also had a pot of water and an egg beater with special microphones. A huge thanks to Peter for making this happen and also thanks to Lief Hall for amazing tech support and taking some of the pics. Le Cheesecake – served at the end of the broadcast. Could not be telematically transport to Heidi Grundmann.